What are your thoughts? When designing patriotic shoes, t-shirts, hats, etc., should their be a moral obligation to produce them in America? We don't necessarily fault Under Armour. This is unfortunately the way of the world. HOWEVER, we wonder if "all" clothing companies should consider this sort of thing more carefully. 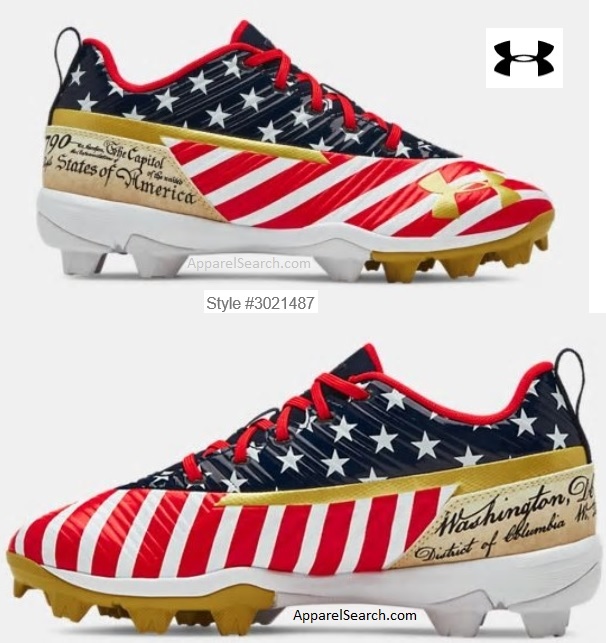 If you would like to purchase the above pictured baseball cleats in boys boys sizes, you can find them while supplies last at the Under Armour website. Learn more at the Under Armour website. Learn more about cleats and other types of shoes here on Apparel Search.